Sorry for the late post but was away this weekend and finally managed to catch up to the latest episode of Top Model! So this episode, the contestants head over to the CW network where the winner of the challenge will receive a scripted walk on role in a full series. Of course, the script they get is a lovers scene including a kiss... >< Mirjana gets jealous of Shei and Denzel who get smooching quickly. So Mirjana and Keith were a mess, Shei did really well, Lenox was commented to have a 'CW' look, Will and Kari were kinda strange to watch. Raelia was hilarious. In the end, the winner is Denzel. So back at the house drama erupts between Mirjana and Denzel about their relationship. Mirjana clearly cares more about that than the competition and is being really immature about it. At the challenge, she was like 'oh this is strictly professional' then comes home to scold Denzel. Later, Denzel makes an offensive comment which upsets Will. Adam reveals the frat party incident that was viral on social media and the two are friendly. The photo shoot this week is on ice, riding the 'Frozen' wave. From what I remember, it was an awful shoot, but we'll see. 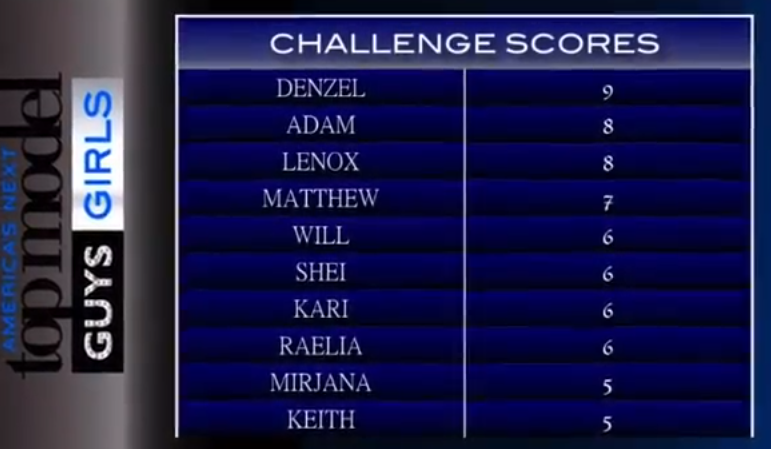 Lenox did well, as did Will...Mirjana and Keith seemed to have struggled. Tyra ousts the tension between Will and Denzel and pretty much lectures him, and then favours Will with a high score... not the best pic of him, but not bad... those shiny latex leggings are really distracting. Cool pose, kinda chilled. I like it. Ok photo... not too keen on it, just looks like he's on the floor crawling around. I actually quite like this photo? Apart from claw hands. First call out ! woop woop! definitely the best shot this week... ! Though the others were quite abysmal so not much competition. Really bad photo- she needs to go home. Just coasting along for way too long. Probably the best shot of the guys imo. Next week Mirjana and Denzel break things off, and the DNA results are in! Chantelle once again outshines some of our remaining contestants!